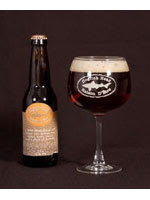 "A deep, mahogany Belgian-style brown ale brewed with beet sugar, raisins, and Belgian-style yeast. We began brewing this one at our brewpub in 1996 (we began packaging and selling it sometime in 1998) as the answer to the question, "What beer should I enjoy with a wood-grilled steak?" Raison D'Etre fits the bill, tasty and as complex as a fine, red wine." This beer has a nice brown, rich caramel colour. Not a lot of carbonation off the glass, but a decent two finger head. The head was a frothy off white to tan colour, with fine champagne like bubbles. The fine bubble can be attributed to the Belgium yeast for sure. Huge raisin smell. Hints of other dark fruits. Very sweet, caramel notes. Some slight spice characters. Definitely a Belgium influenced beer. Not a huge nose, but pleasant overall. A bit subdued. Very light on the front of the tongue. As it moves over and to the back of the mouth, you get hit with lots of raisin. It is definitely the most pronounced flavour in this beer. Some typical brown ale breadiness. A bit of spice. With it not being overly carbonated, it has a very mellow mouth feel. It is somewhere between a brown ale and a Belgium dubbel. An interesting beer. Stylistically, it is a bit lost between a brown ale and a dubble. It has more spice notes than a typical brown ale, and is overwhelmed with the raisin and not enough fruit diversity for a dubbel. This beer is good, not great. It would be interesting with dessert. The beet sugar gives it lots of sweetness. It would pair well with a rich, dense chocolate torte. Overall I give this beer a B. Not the best thing Dogfish Head has to offer but good.